My sister Michelle sent me a cookbook out of the blue the other day. I was very excited to see Mollie Katzen’s Vegetable Heaven in the package, since it’s a book I’ve been wanting anyway. I love how creative the recipes are, yet they’re still simple enough to try on a weeknight. This is the first recipe I’ve tried from the book, and of course I changed things up a bit. Mollie Katzen recommends wok-frying the broccoli florets and stems separately, creating a stir-fry instead of a brothy sauce. We love brothy, we don’t have a wok, and we usually use the pre-cut fresh broccoli florets, so that’s what we went for when making this recipe. It’s so simple and delicious…it will definitely be added to our regular-repeaters list. In a large skillet, saute garlic in olive oil until just turning golden. Add broccoli, tomatoes, and broth, stirring to combine. Cook, uncovered, over medium heat until broccoli is tender and cherry tomatoes have started to burst. Meanwhile, cook the linguine according to package directions. 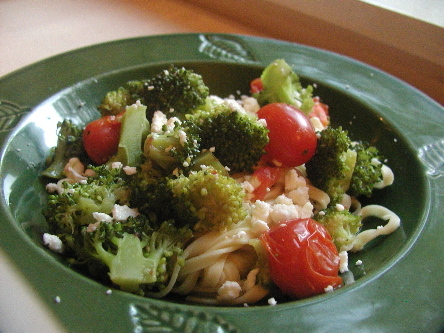 When it is al-dente, drain it and add it to the vegetables along with the feta cheese. Toss to combine, and season with salt and black pepper. Source: Adapted from Mollie Katzen’s Vegetable Heaven. Sounds like a cookbook I need to find! We love broccoli here too. Infact its on the menu for tomorrow! Sounds like a nice and light dinner! I like your veggies. Keep cooking!